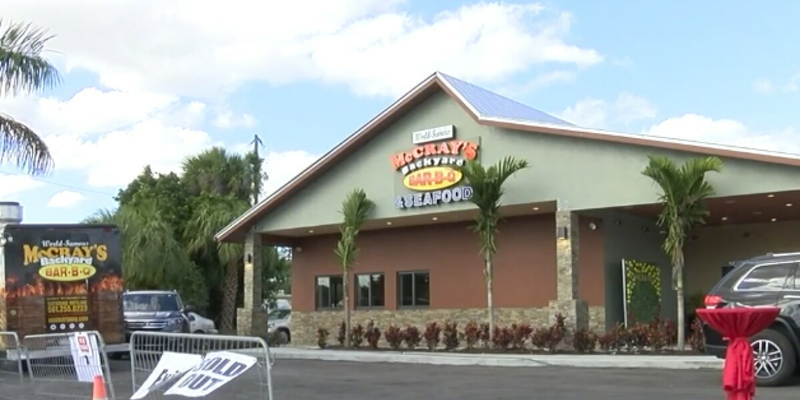 MANGONIA PARK, Fla. — A Palm Beach County staple celebrated opening a new location in Mangonia Park Tuesday. McCray's Backyard Bar-B-Q has been a part of the community for 85 years. With a walk up fit for a movie premiere, with NFL players approval, McCray's introduced it’s new addition. Betty Lou McCray Wells is a longtime family friend, “Even when he was a little boy, he worked with his father extensively, trying to cook a little rib and something. Now, he’s a big boy,” she said about the owner, Derrick McCray. It’s a near nine-decade old tradition, all based in Palm Beach County. It was founded by Herman McCray Jr., now it’s run by his son, Derrick. Miami Dolphins legend and Hall of Famer Larry Little was in attendance. “I’m so happy for him. I remember when he was tiring to get this building done and it’s finally coming to fruition, I’m happy for him,” Little said. It’s a family business, that with the right ingredients has thrived. “I think any family be successful if they have the heart, if they’re dedicated, they have the goal, the ‘go get with it-ness,’ and they have the ‘go get with it-ness,’” Wells said. McCray’s will officially open to the public on Memorial Day.